Remember the name JoJo Earle. The sophomore wide receiver took center stage in Aledo’s 51-14 demolition of Bentonville (AR), hauling in five passes for 161 yards and three scores—and, in the process, launching himself into the consciousness of future opponents and talent evaluators, if he wasn’t there already. Earle’s big game came as Bentonville was filling the box in an effort to stop five-star running back Jase McClellan—which, in and of itself, wasn’t very effective. McClellan cruised to 88 yards and a score on 16 carries and took the fourth quarter off. With single coverage on the outside for much of the afternoon, the onus fell on Aledo quarterback Jake Bishop to make things happen—and that’s just what he did. The senior gunslinger was outstanding and efficient, completing 10-of-14 passes for 237 and three scores—all to Earle. The Bearcats wasted no time getting on the board after inheriting a short field. On the fifth play of a 24-yard drive, Bishop found Earle from five yards out for touchdown No. 1. One possession later, it was McClellan, running through tacklers and getting to the pylon for his first and only score of the day. Just over six minutes into the game Aledo led 14-0. Spoiler alert: It didn’t get any better for Bentonville from there. The Bearcats would score on four of their first five drives before a Bentonville flea flicker made it 24-7 with 7:34 to go in the first half. Unfortunately for the Tigers, Aledo would score 21 unanswered from there—including a pair of Bishop-to-Earle touchdown strikes, to put the game away. Four-star defensive end Colt Ellison wreaked havoc on the Tigers in abbreviated duty, totaling three tackles for loss and three sacks. 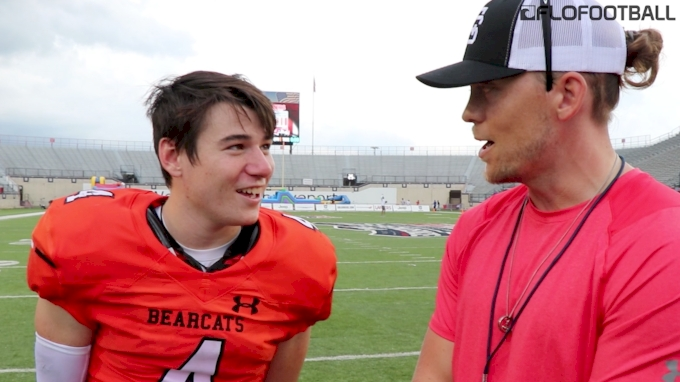 All told, Aledo would roll up 440 total yards of offense while holding Bentonville to just 14 first half rushing yards and 168 total yards on the day.